Laminate flooring, a European import now widely popular in the United States, is amazingly effective at imitating wood, tile, stone, and other materials. The surface of laminate flooring is a highly detailed photographic image that is overlaid with transparent, extremely durable plastic laminate (similar to the material used for countertops). It isn’t until you actually touch the grout joints or scan for natural imperfections that you realize the flooring is not what it appears to be. The base material is a melamine/aluminum oxide/fiberboard composite product, often medium-density fiberboard (MDF). A backing layer is then added to prevent moisture seepage, which can damage the planks. When it comes to price, real wood, tile, and stone cannot compete with laminate flooring. At from $3 to $6 per square foot installed, laminate flooring is less than half the cost of these other materials. Several companies make laminate flooring. Popular brands include Pergo, Wilsonart, Formica, Shaw, Armstrong, and Mohawk. It pays to go with quality materials because their inner cores have greater protection from moisture damage, their surfaces are more scratch-resistant, and they are more realistic at imitating other materials. Laminate flooring is sold in 15-by-15-inch- and 24-by-24-inch-square tiles and in thin 8-by-47-inch tongue-and-groove plank-like strips about 3/8 inch thick. 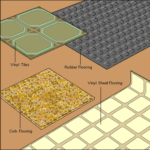 Nearly all types are designed to be glued or, in some cases snapped, together along their interlocking edges and then installed over a thin foam pad (the result of this technique is called a “floating floor”). The foam pad beneath the surface provides a moisture barrier and minor cushioning. Laminate flooring requires a reasonably flat, smooth base such as vinyl, plywood, tile, or hardwood flooring (but not carpeting); a flat, smooth concrete slab is acceptable, but it’s wise to apply a vapor barrier before putting laminate on a slab. 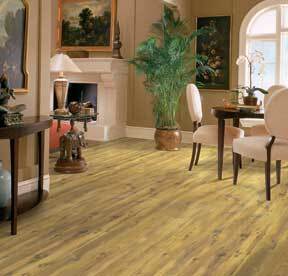 Each manufacturer of laminate flooring products offers complete installation instructions. Follow the directions implicitly if you do the installation yourself. Here is a video of a segment I did for HGTV on How to Install Laminate Flooring. It will show you the entire process. Before installing the material, allow it to sit in the room for two or three days to acclimate to the room’s humidity and temperature. Cut the pieces using a power saw. Be advised that strong light glancing across the surface—such as from a large window or patio door—may illuminate seams; to minimize the visibility of seams between plank-style flooring, run the material perpendicular to such doors or windows. If you are installing a laminate floor in a bathroom, you must be particularly careful to join and seal the edges of the planks according to the manufacturer’s directions to prevent moisture from seeping between or below the planks. Also check the product’s warranty to be sure it covers this type of installation. Over time, ground-in dirt will cause small scratches, so it pays to keep laminate floors clean. Picking up dust or loose dirt is easily done with a dust mop or vacuum; for more in-depth cleaning, use a damp mop or damp towel, but don’t saturate or allow water to stand on the floor. Do not use abrasives or scouring powder, polishes, or waxes. Touch-up sticks are available from some manufacturers for deep scratches. Following installation, it pays to keep a few extra pieces in case damaged areas need replacement.